May 22, 2010, 9:21 PM · Today, I spent and hour and a half walking around the Busch family's first park. No, I didn't visit Busch Gardens Tampa, which opened in 1959. Nor was I down in San Diego, where SeaWorld debuted in 1964. Nope, today I walked around the original Busch Gardens park, Busch Gardens Pasadena, which opened to the public in... 1906. The original Busch Gardens closed in 1938, during the Great Depression. Developers bought and sub-divided the property, eventually building a neighborhood of homes that obliterated most of the old park. Located about two miles south of the Rose Bowl, the Busch Gardens site occupies about 38 acres west of Orange Grove Boulevard. 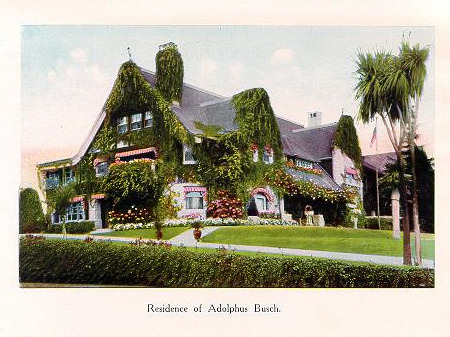 Adolphus Busch bought a home on the Orange Grove "Millionaire's Row" in 1904, which he dubbed "Ivy Hall" for its lush ivy coating. Other famous families keeping winter homes on Orange Grove included the Wrigleys (of gum and Wrigley Field fame), whose mansion now houses the Tournament of Roses headquarters, and the Gamble family (of Procter & Gamble, producers of Ivory soap and dozens of other famous brands). The Gamble House, incidentally, is well-known to movie-goers as Doc Brown's house in the "Back to the Future" films. Unfortunately, the Busch family's Ivy Hall no longer survives, having been replaced by several apartment complexes. 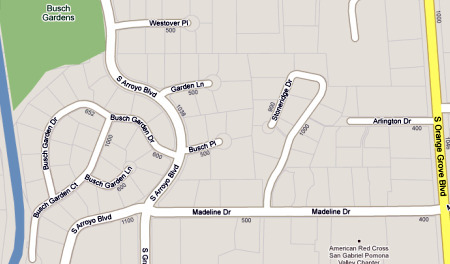 On the Google Map below, the "upper" Busch Gardens occupied the gray space north of Madeline Dr and between S Arroyo Blvd on the west and Orange Grove on the east. 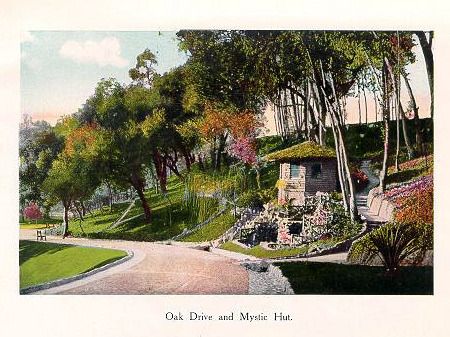 The "lower" Gardens occupied the gray space west of S Arroyo Blvd. Ironically, the green area that Google lists as "Busch Gardens" actually was outside the park's boundary. At its peak, the gardens occupied 40 full-time gardeners, who terraced the landscape using mules, as there was no power grading equipment at the time. The gardens were the design of Robert Gordon Fraser, who lived at the gardens until their closure. Here's the one remaining element of the entrance to the park's lower garden. The ticket booth stood across the street to the right: 25 cents for adults and 10 cents for children. You needed to buy an addition admission to visit the upper gardens across Arroyo - but all the money went to support injured war veterans in the community. 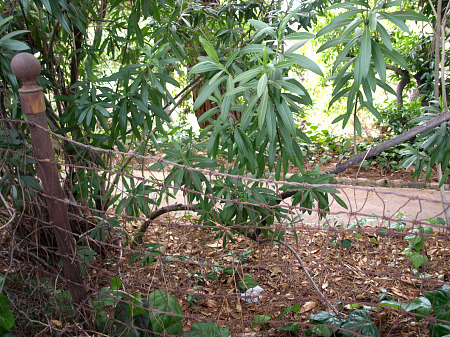 Walk along the west side of Arroyo and you might find some of the original metal V fence that surrounded the property. Throughout the property, you could find several drinking fountains. Although they were made to look like hollowed out logs, with water pouring into them from a wooden spigot, they actually were made of concrete. The park held seven of these water troughs. One was moved to the Busch-owned Grant's Farm in St. Louis, but five have been lost. 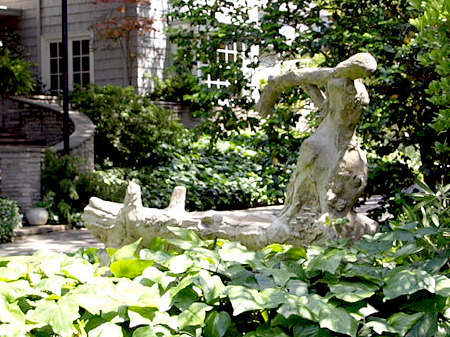 The last such fountain remains visible at end of one Pasadenan's driveway. One of the popular features in the lower garden was the "Mystic Hut," which stood behind a series of stone-lined pools. The hut is gone, but you can still see its foundation, along with the stone-lined pools, on the north side of Busch Garden Drive. Another spectacular feature of the lower garden was a Grecian pergola. Today, that pergola survives, thought it's been enclosed on the outer edge with windows, and incorporated into this Arroyo Blvd home. You can see it on the right. 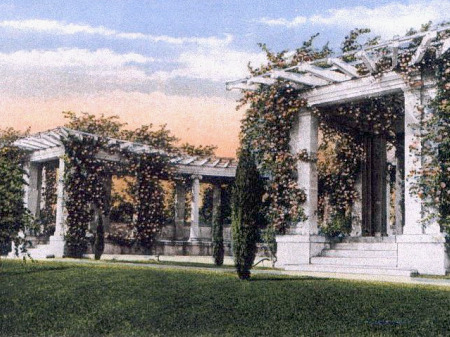 In postcard above, the pergola was photographed from the opposite side, where the home now stands. 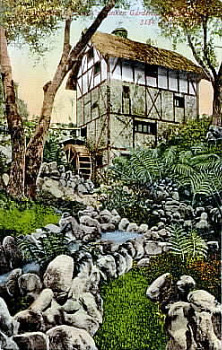 The icon of the gardens was found in the upper garden - The Old Mill. The mill still stands, as part of a private residence, onto which the owner graciously invited tour attendees. We were not able to take photos, though I can report that the mill (which is on its second replacement wheel these days) looks much as it did in that old postcard painting, though the mill building's been expanded a bit in the front and back, to accommodate the families that have lived there since the gardens closed. Historian Michael Logan organized today's tour, and I spoke with him for a few moments after his introductory lecture preceding the tour this morning. 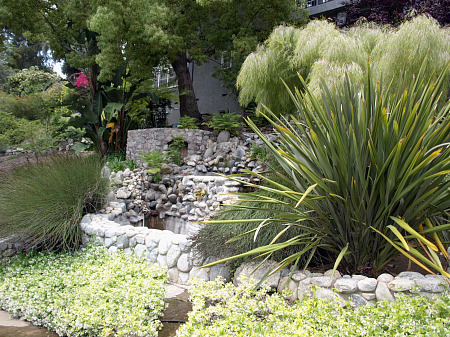 I'm hoping to have the opportunity to chat with Michael again soon, and to share a few more stories about the Busch family and the development of their beloved gardens, in Pasadena and around the country. Postscript: Even though Pasadena's Busch Gardens are gone, if you are in the area and want to see what they might have looked like had they survived, consider a visit to the Huntington Library and Gardens, located a few miles to the east in San Marino. 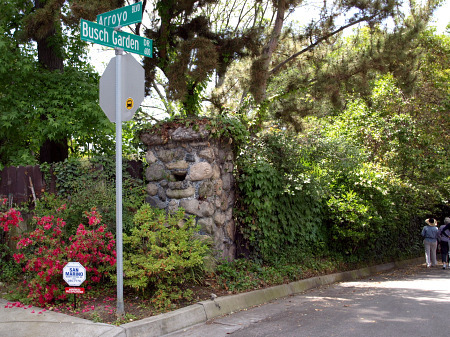 Henry Huntington, nephew of one of the founders of the Central Pacific Railroad and the owner of Los Angeles' street car system, began building his gardens a few years after Busch. Today, his gardens survive on a 120-acre site, which include libraries and art galleries housing a Gutenberg Bible, the manuscript of Benjamin Franklin's autobiography and Thomas Gainsborough's famous painting "The Blue Boy." 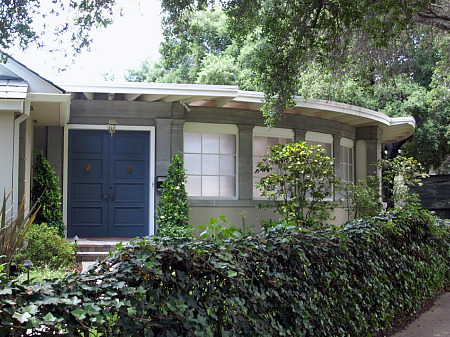 Post-postscript: Here's a little celebrity trivia: On Stonebridge Dr., the hook-shaped street in the middle of the upper gardens, you'll find (at 980) the last home of actor Robert Reed, best known as Mr. Brady on the Brady Bunch, who lived at that home for several years before dying of cancer in 1992. May 22, 2010 at 11:40 PM · I had only heard of (and been to) the one in L.A. (Van Nuys). I even drove by there twice last weekend for work. I didn't know about this one. It fits well with the other nice places like it in Pasadena. Great pics. Looks like it was a fun tour. May 23, 2010 at 6:28 AM · Very interesting. I grew up going to the one in Van Nuys, and never heard of this one that predated it. It's interesting that it was so close to Huntington Gardens. May 23, 2010 at 12:57 PM · Looks cool. I may have to check it out next time i'm in LA. May 23, 2010 at 4:02 PM · Reading this article actually made me a little sad. I hate seeing something that used to be so beautiful go to trash because of modern developments. PLUS, there still is a Busch legacy today. The old Busch Gardens wasn't a completely abandoned idea-- they should've transferred more of the remnants of the old park into the existing parks today. I know... I know... the parks aren't owned by Busch anymore... but I'm sure each existing park would still like to showcase some of their history. Some of those momentos would've been great to show during Busch Gardens Tampa's recent 50th birthday celebration last year. And I've been to Huntington Gardens. VERY, VERY beautiful. 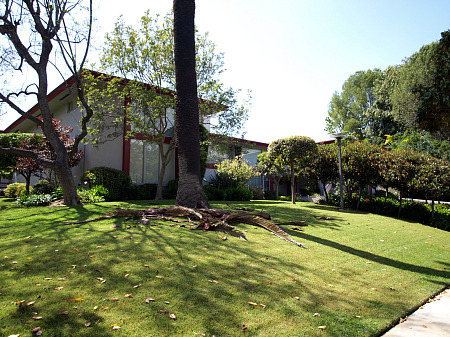 May 25, 2010 at 2:48 PM · I would like to see an article about the park in Van Nuys. I only went there once as a VERY small kid (it closed when I was 7) I don't remember much of anything, but I would love to hear more about it. Maybe it will jog my memory.